Neil Gaiman’s Stardust meets John Green’s The Fault in Our Stars (Okay, we're making some strong claims here. Stardust!? TFiOS? I mean, I get that Neil blurbed it, but...still. I get a little eyebrow raisy. Also, please explain to me how tongue-in-cheek fantasy meets heartwrenching contemporary cancer book? If it's because of Aza's lung disease only, I will be pissed.) in this fantasy about a girl caught between two worlds…two races…and two destinies. Only her best friend, Jason, listens. Jason, who’s always been there. Jason, for whom she might have more-than-friendly feelings. (Yeah, yeah. Heard this one before. Is it even necessary to mention the feelings part? I'd pretty much assume.) But before Aza can consider that thrilling idea (Jason? The ship? Jason on the ship? I'm confused), something goes terribly wrong (This is kind of vague. What was supposed to happen if it went right? It doesn't grab me.). Aza is lost to our world—and found, by another. 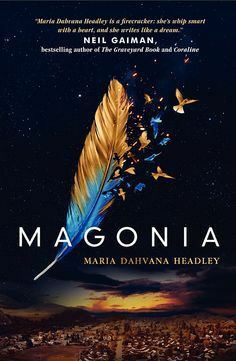 Magonia. Claims of grandeur aside (I'm looking at you, first sentence!) it's a pretty good blurb. The first half definitely is. It starts out with very pithy, concrete details that set up a unique conflict. I mean, potential hallucination ship? Desperate girl with a deadly disease? It's the perfect place for some magic, and the blurb also describes it in a very compelling way. Then we get to the second half and it kind of waffles. We have the typical best friend love feelings OMG sparkly bit, yeah, yeah. And then that's sort of lumped in with "Oh, yeah. Something happens. She's in Magonia, yay!" Which I'm sure does not do justice to what actually happens. Then it gets better again. We have this bit about her disease being gone, her strange and amazing power, and it's nice and succinct again. But then we go back to the wishy washy vagueness. There's a war! For some reason! Loyalties! It's just kind of meh. But there's enough meat here aside from the vagueness that I'm really intrigued, so overall, it does the job.